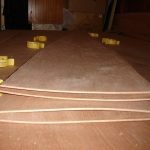 Anyone who has had plywood sitting around their garage or workshop for more than a few days knows about the problems of warped plywood. It seems that just about any sheet of plywood is likely to bow or warp, even if stored the “right way.” Once bowed, it’s hard to work with and at times needs to be replaced, as it can’t be used for its original intent. However, it is possible to straighten warped plywood and use it, just as if nothing had happened to it. Lumber core plywood is worse for this than veneer core, so if you are not going to use the plywood immediately, you’re better off avoiding lumber core plywood. It is also harder to flatten than veneer core, with a greater chance of the plywood breaking during the flattening process. Warping and cupping in plywood is caused by a combination of moisture and heat. If you were to measure the moisture content of the outer veneer on both sides, you’d find that the concave side has a considerably lower moisture content than the convex side. That difference in moisture is what is causing the bow or warp, regardless of how it happened. This can come about from plywood sitting in the sun or sitting somewhere where there is excessive moisture. The sun causes moisture to leave the wood, while excessive humidity will naturally be absorbed by the wood grain itself. Generally speaking, the way that the board was laid allowed one side to be exposed to moisture or heat, while the other side was covered. In cases where both sides are covered equally, it is very rare for plywood to bow or warp. In cases where the amount of bow or warp is slight, the plywood can still be used, especially if being attached to a strong structure. The structure itself will hold the plywood straight, allowing the moisture content of the two sides to equalize and the sheet to flatten. 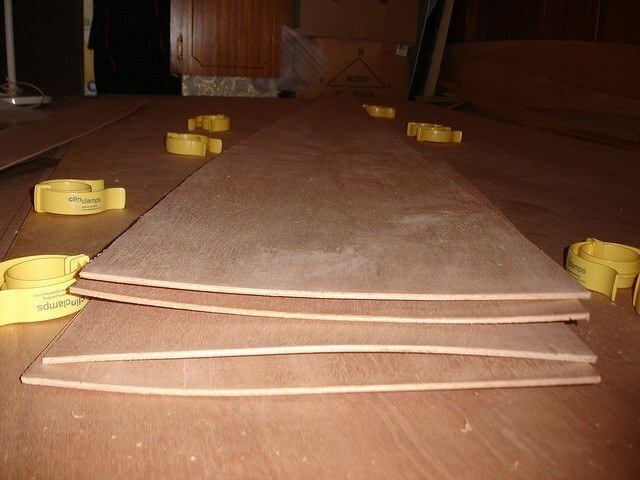 Often, bowed plywood can be used for smaller pieces of a project, while the flattest sheets are used for the large ones. Always start cutting with the biggest pieces needed, so that you can pick them out of the best possible sheets. 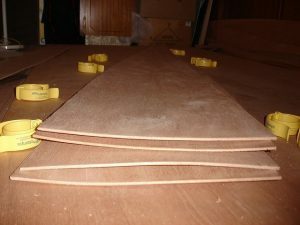 How to straighten warped plywood? If there aren’t enough flat sheets for all the big pieces and the structure isn’t strong enough to straighten it, then it will be necessary to straighten the plywood. Straightening the plywood requires balancing the moisture content of the two sides. Once that happens, the wood will be flat. To do so, wet the concave side of the plywood with a spray bottle or sponge. Then place the sheet with that side down, either directly on a flat concrete driveway or shop floor, or spaced above the floor by furring strips. The furring strips will allow air circulation, helping to prevent mildew and warping to the other direction. Weighing the sheets down with concrete blocks, filled five gallon buckets and other weights can help as well. The sheet will flatten on its own if left in this condition. If it is left this way in the sun, it will straighten surprisingly quickly, and may even bow the other way, if you are not careful. Keep an eye on the sheet of plywood as you are removing the bow, to ensure that you don’t leave it sitting out too long.